Casa Argentina de Houston | Eventos amigos: "Culture in Convergence"
Margret Alkek Williams Crain Garden, Methodist Hospital. The Pan American Cultural Exchange is pleased to present flutist Marcelo Álvarez and guitarist Ingrid Chalar in their first visit to Houston! This guitar and flute duo formed in 2003 in Patagonia, Argentina. Their aim is to popularize chamber music while working with a wide and universal repertoire, including Argentine and Latin American music. They intersperse teaching at Trelew Artistic Education Institute with performances at numerous concert halls in cities throughout Patagonia. They will perform works by Cacho Tirao, Ferenc Farkas, Castelnuovo Tedesco, Jaime Romero, Anibal Troilo, Atahualpa Yupanqui, Marcelo Álvarez, and Astor Piazzolla. Pan American Cultural Exchange is pleased to present flutist Marcelo Álvarez and guitarist Ingrid Chalar in their first Houston visit as a duo from November 5 to 13, 2017. 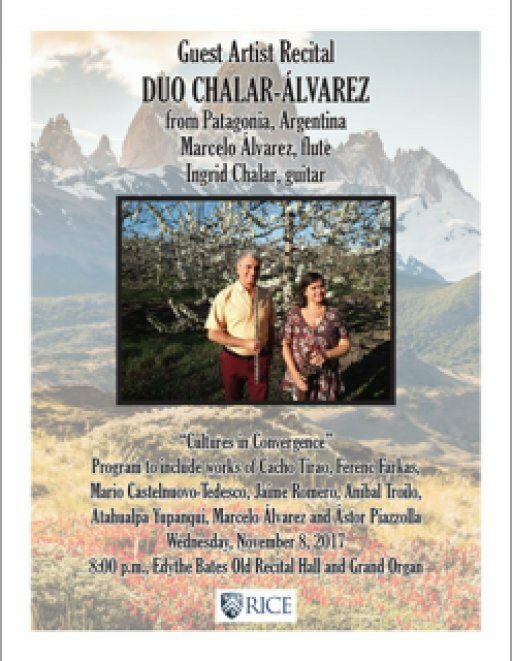 This guitar and flute duo started in 2003 in Patagonia, Argentina. Their aim is to popularize Chamber Music, working with a wide and universal repertoire to also include Argentine and Latin American music. They intersperse teaching at Trelew Artistic Education Institute with performances at numerous concert halls in cities throughout Patagonia. As educators they will offer master classes at Amigos por Vida–Friends for Life Public Charter School, Bellaire High School and Shepherd School of Music in addition to four concerts in diverse and exquisite locations in Houston, all free to the public. This project is supported in part by Amigos por Vida–Friends for Life Charter School; Performing Arts Medicine at Methodist Hospital; The Kung Family Woodwind Guest Artist Fund through Shepherd School of Music at Rice University; Consulate General of Argentina in Houston; the Centro Cultural Colombiano and Casa Argentina de Houston.